One of them, Andrew Urdiales, was a former Marine and accused serial killer. Andrew Urdiales is pictured in court in this undated picture. Two high-profile killers sentenced to death row for their crimes in Southern California were found dead in suspected suicides in their cells, officials said Monday. One of them, Andrew Urdiales, 54, was a former Marine who killed five women in Southern California. He was found dead, just weeks after he was sentenced to death for the murders of five women. During a security check in the adjustment center on Friday at 11:15 p.m., jailers found him unresponsive. Urdiales was given CPR, but he was declared dead at 12:01 a.m. on Saturday, said officials with the California Department of Corrections and Rehabilitation. 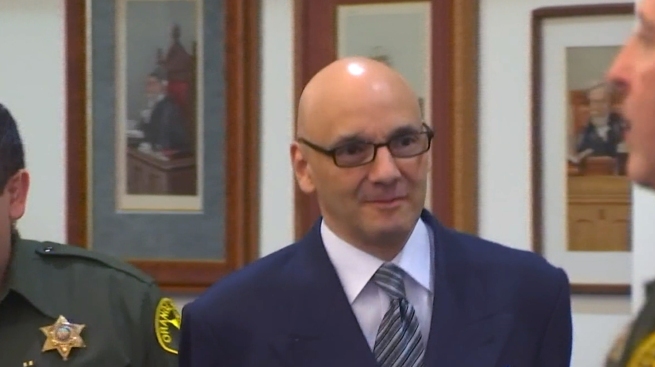 He was sentenced Oct. 5 and had been on California's death row since Oct. 12. His cause of death is pending the results of an autopsy; however, his death is being investigated as a suicide. He was single-celled. Urdiales, a former U.S. Marine was discharged from the military in 1991. Speaking in the courtroom, Urdiales said he respects the jury's decision and probably would have done the same thing. "I understand how they voted," he said. "If I were a juror on my case I would probably have done the same thing. There's no hard feelings." He went on to speak to victims' families. "I'm a little shaken actually, a little nervous," Urdiales said as he offered "sincere apologies" to jurors, the judge, prosecutors, victims' families and his own family for having to hear the "gory" details of his crimes. Urdiales killed five women in Orange, San Diego and Riverside counties between 1986 and 1995, but it was an Illinois triple-murder case that brought him to the attention of investigators looking into the Southern California killings. The California serial killings began with an attack on a 23-year-old Saddleback College student, according to investigators. The body of Robbin Brandley was found in a school parking lot, stabbed 41 times. She had been working earlier that night as an usher at a campus event. Over that past three decades, her father's memories of the day Brandley left for college and never came home have mingled with frustration and anger. Her mother died in 2011. Urdiales told Chicago detectives that they also might want to ask him about people in California, Orange County prosecutors said in opening statements at his trial. He subsequently spoke with Orange County investigators, and he was arrested in 1997 on suspicion of killing an Orange County woman when he was a Marine at Camp Pendleton. He killed the four other women, in Riverside and San Diego counties, when he was stationed at Twenty-Nine Palms. The second inmate, Virendra Govin, 51, was found unresponsive in his cell on Sunday at 10:15 p.m.
Govin was sentenced to death by a Los Angeles County jury on Dec. 21, 2004, for the first-degree murders of 42-year-old Gita Kumar, 18-year-old Plara Kumar, 16-year-old Tulsi Kumar, and 63-year-old Sitaben Patel. Govin, his brother Pravin Govin, and Carlos Amador, then set the Kumars’ home on fire. Govin was received onto California’s death row on Jan. 5, 2005. His brother Pravin has been on death row since Sept. 19, 2005. The cause of death for both of them are pending results of an autopsy. Their deaths are also being investigated as suicides. There is no indication that Govin's and Urdiales' deaths are related.